Based on reviews from 51 experts and 6,561 users. Learn how our rankings work or see our guide to New Balance trail running shoes. Updated Apr 2019. The New Balance trail running shoes are sure to deliver comfort and durability, especially when tackling a wide variety of uneven and challenging trails. New Balance has a wide collection of shoes that are perfect companions for walking and running. 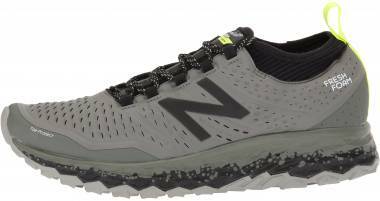 Trail running shoes from New Balance aims to provide excellent cushioning, stability, minimal design and lightweight feel throughout the user's activities. Flexible. Users need a running shoe that is flexible, especially in the forefoot area. When planning to buy a New Balance trail running shoe, remove any insert and test if its bends quickly. New Balance utilizes midsole compounds that provide flexibility throughout the run. Low heel drop. Some running shoes have built-up heels for stability, ideal for users who have the possibility to strike with the forefoot. More often than not, New Balance trail running shoes feature a heel drop of 8 millimeters or less. No flared heel. We all know that some runners strike with their heels. As a result, they do not want to use a shoe that has a flared heel. For runners, a slightly undercut heel is best to use to prevent the forward rolling with every stride. This is essential in reducing the possibility of injury during the running activity. Perfect Fit. New Balance has a big advantage because they have a collection of various widths and models that suit the runner's foot shape and gait. It is important to choose a trail running shoe that fits well. Fit affects the runner's performance and confidence throughout the activities. Durable. With the utilization of a rubber outsole, the durability of the New Balance trail running shoes is ensured. Users will be able to use the shoe for a longer period of time. Grippy outsole. Traction is one of the most important characteristics of a trail running shoe. It should be able to provide the right amount of grip needed in tackling a wide variety of surfaces. Water-resistant. Some New Balance trail running shoes are water-resistant. This is essential in keeping the foot dry, especially on wet running conditions. New Balance trail running shoes are packed with reliable technologies to help runners tackle the trail with confidence. Below are the technologies and materials found in most New Balance trail running shoes. Vibram outsole. The Vibram outsole is utilized in many New Balance trail running shoes like the Minimus 10 v1. This material is essential in delivering the maximum amount of ground contact that the user needs when tackling different types of trails. AT Tread outsole. This material is described to be a trail-specific outsole that is engineered to provide traction on different types of surfaces. The AT tread outsole works well with the multi-directional aggressive lugs. Together, they keep users upright on the downhill and uphill runs. HydroHesion rubber compound. This full-length material is used on making New Balance trail running shoes. It is designed to deliver the right amount of traction needed, especially on wet surfaces. Gripping nodes. Some of the New Balance trail running shoes have gripping nodes that are found on the outsole area. This is not prominent in most trail running shoes. Its design is focused on making the shoe to function well on paved surfaces and building floors. With the utilization of the gripping nodes, it will be easier to transverse uneven terrains. Fresh Foam. New Balance added the Fresh Foam midsole in crafting their trail running shoes. This material is described to be a single piece midsole foam that aims to deliver durable cushioning. This responsive but lightweight foam responsibly cushions the foot with every stride, keeping the runner comfortable and free to move the foot naturally. RevLite. New Balance trail running shoes feature the RevLite. This lightweight material is marketed as more responsive and stronger when compared to other midsole compounds. It is strategically-designed to prevent early breakdown and sagging of the shoe. Rock Stop. The Rock Stop is utilized in crafting the New Balance trail running shoes. The Rock Stop is described to be a layer of dense material that is located in the forefoot area. Its primary goal is to protect the foot against trail debris and rough surfaces. It also aims to diffuse the energy that is generated by a force and effectively attenuate impact shock. Response 2.0. Integrated into the New Balance trail running shoes is the Response 2.0. This material is a performance insert that is focused on providing additional cushioning. The flexibility of the material does not compromise the bending capacity of the joints in the toes. Gore-Tex. This is a water-resistant membrane that aims to improve the runner's confidence, especially in wet weather conditions. Users will not have to worry about mild water splashes to come in their way while running. Fantom Fit. Composed of two materials, an overlay-and-underlay system is combined together with the use of the no-sew method. The primary goal of this feature is to ensure a more secure yet personalized fit. Toe Protect. New Balance trail running shoes utilize the Toe Protect. This material is a thin layer of rubber that acts as protection from hazardous and sharp objects that can be found on the trails. Synthetic mesh covers. Integrated into the New Balance trail running shoes is the synthetic mesh cover. The goal of which is to provide lightweight breathability. Along with the mesh cover is the synthetic overlays. This is essential in wrapping the foot securely to give a more comfortable fit while running. Acteva foam. Acteva foam is described to be lighter when compared to standard EVA foams. The material is meant to provide a more comfortable and responsive ride that the runner will enjoy. Below are the five best New Balance trail running shoes. 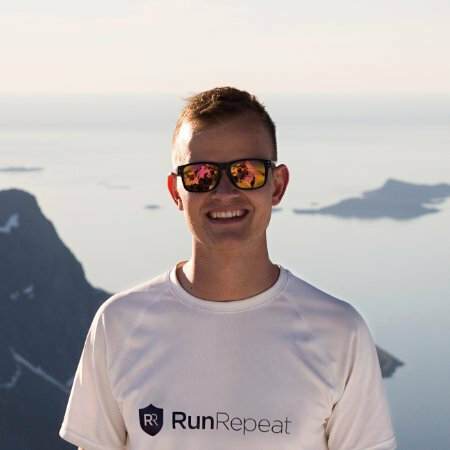 The information is based on RunRepeat's Corescore as of January 2019. The New Balance Fresh Foam Gobi Trail is a running shoe that uses technologies and components that are lightweight in structure. The running shoe sure to provide excellent performance, protection, and comfort when tackling a wide variety of paved surfaces and trails. A durable outsole tread is designed to function and perform well on both the trails and roads. On uneven and flat surfaces, this layer protects the rest of the platform from wear and tear. The outsole provides reliable traction as well. The upper area of the New Balance Fresh Foam Gobi utilizes a no-sew construction. This feature of the shoe is helpful in keeping the foot free from irritation. As a result, a more comfortable ride is experienced by the runner. The fabrics used in crafting the upper unit wraps the foot with ease. New Balance made sure that the fit was snug without sacrificing the unrestricted foot movements. Because of the utilization of this fabric, the user is also protected against debris and other hazardous materials that can be found on the trails. The lightweight and responsive midsole of the Fresh Foam Gobi Trail is made from a single-piece foam. This well-cushioned layer of the shoe keeps the foot safe and protected from impact forces with every stride. It has a soft nature that makes every movement of the foot natural and comfortable. The New Balance Minimus 10 v1 is designed for those who have neutral foot pronation. Because of the utilization of the mesh upper, added flexibility is offered. It also gives a breathable coverage to the foot. The Vibram outsole is used in making the New Balance Minimus 10 v1. It aims to deliver the right amount of traction needed when tackling a wide variety of surfaces. Used in the midsole area of the running shoe is the Acteva foam. The primary focus of this foam is to provide additional comfort to the foot throughout the running activity. With the excellent support, fit and stability that the New Balance Minimus 10 v1 offers, the majority of the wearers were happy and contented. This New Balance shoe features the AT Tread outsole. It is described as a reliable outsole material that is crafted to provide a good amount of traction on various surfaces. 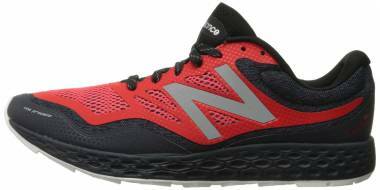 The New Balance Fresh Foam Hierro is a visually-appealing trail shoe that is engineered with reliable components and technologies. These features effectively protect the platform against the hazardous nature of the trails. It aims to deliver underfoot support without compromising the comfort it provides for daily walking, running and training. Another new feature of the shoe is the brand’s Fresh Foam midsole. This material is said to take the shoe's cushioning system to the next level. The foam is built from a one-piece midsole material which is focused on delivering a more comfortable cushioning and softer underfoot feel. The cushioning system of the New Balance Summit Unknown uses the RevLite foam that offers better shock attenuation. This material is a full-length compound that has a primary goal of providing a more responsive cushioning. Between the outsole and midsole, a high-density forefoot plate is affixed. The purpose of which is to protect the foot against irregular surfaces and debris. The outer sole of the shoe utilizes a sticky rubber compound. This material provides a good amount of grip on both wet and dry surfaces. Its trail-optimized design brings confidence to runners over a wide variety of outdoor terrains. The upper unit of the running shoe features a synthetic mesh. This mesh is vital in providing a well-protected and more secure coverage. It possesses tiny ventilation holes which allow fresh air into the interior of the shoe. A lot of users were satisfied and happy with the New Balance Summit Unknown's excellent performance on the trails. They appreciated its quick-draining and breathable upper unit as well as the lightweight construction and semi-aggressive outsole. This made the New Balance Summit Unknown a perfect partner for trail running. The New Balance Fresh Foam Kaymin TRL, a trail running companion, is intended for those who have neutral pronation. It is reinforced with some add-ons that make the shoe stronger. It does not have a bulky design, which makes the platform to permeate most off-road. It features a breathable mesh that covers the foot, keeping it well-ventilated throughout the run. A Gore-Tex water-resistant membrane is utilized in the running shoe. Its primary goal is to help in preventing splashes of water from coming into the footwear. The New Balance Fresh Foam Kaymin TRL also has synthetic overlays that aid in providing a more secure fit. The outsole unit of the shoe features semi-aggressive gripping lugs that aim to prevent any instability, especially when tackling flat and uneven surfaces. A Toe Protect is used in crafting the shoe. It is described as a rubber layer that protects the forefoot from hazardous trail materials and debris. What are the best New Balance shoes for trail running? The New Balance Minimus 10 v1 is the best trail shoe from New Balance. The shoe is lightweight and more affordable compared to other trail running shoes. What is the most affordable new balance trail running shoe? The most affordable trail running shoe from New Balance is the 510 v4. The shoe retails at less than $100. What differentiates New Balance trail shoes from road running footwear? The structure and composition of the trail running shoes and road running shoes are the main difference between the two. Shoes that are engineered for road running are specifically-designed to use lightweight materials. The primary reason for this is to encourage responsiveness and speed. Trail running shoes are generally heavier because they are crafted to provide better foot protection, stability, and durability.